I have a JD 317 with a completely destroyed Kohler KT17 (Connecting Rod broke). 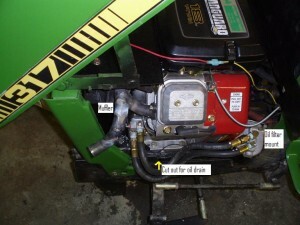 I have found a 10 HP Diesel that is quite inexpensive and was wondering if this would be underpowered to run the 317. The only reason I am contemplating this is because the diesel more than likely generates as much if not more torque than the KT17. I have also read in other blogs that there are driveshaft issues with 317 as well? I would like to remedy these issues if I swap in a new engine.